A collection of empathy-driven design challenges. Creativity Catapult is a research-backed, expert-curated collection of activities that promote creativity skills in children ages 2-14. A Google Drive folder of rubrics from the Buck Institute. A life lesson that all parents want their children to learn: It's OK to make a mistake. In fact, hooray for mistakes! As one artist incorporates accidental splotches, spots, and misshapen things into her art, she transforms her piece in quirky and unexpected ways, taking readers on a journey through her process. Colby Sharp invited more than forty authors and illustrators to provide story starters for each other; photos, drawings, poems, prose, or anything they could dream up. When they received their prompts, they responded by transforming these seeds into any form of creative work they wanted to share. The result is a stunning collection of words, art, poetry, and stories by some of our most celebrated children book creators. With a simple, witty story and free-spirited illustrations, Peter H. Reynolds entices even the stubbornly uncreative among us to make a mark -- and follow where it takes us. A creative spirit learns that thinking "ish-ly" is far more wonderful than "getting it right" in this gentle new fable from the creator of the award-winning picture book The Dot. A website for collaborative brainstorming. A short film to accompany Peter Reynolds' "Going Places"
Creativity has always been essential for our cultural growth, but there are still many misconceptions about this elusive process. Being a powerful creative person involves letting go of preconceived notions of what an artist is, and discovering and inventing new processes that yield great ideas. Austin Kleon's Ted Talk "Steal Like An Artist" is a creative manifesto based on 10 things he wish he'd heard when he was starting out. Designer Tim Brown talks about the powerful relationship between creative thinking and play -- with many examples you can try at home (and one that maybe you shouldn't). A short video to accompany Peter Reynold's "Going Places." But then I started to wonder: What actually happens to us when we get bored? Or, more importantly: What happens to us if we never get bored? And what could happen if we got rid of this human emotion entirely? An adaptable Glow and Grow chart for providing constructive peer feedback. After discussing what a compliment is, each student gets a chart with classmate names and space to write a compliment. Students cut up the strips afterwards, and put each strip in the corresponding envelope. Envelopes are then distributed to students. 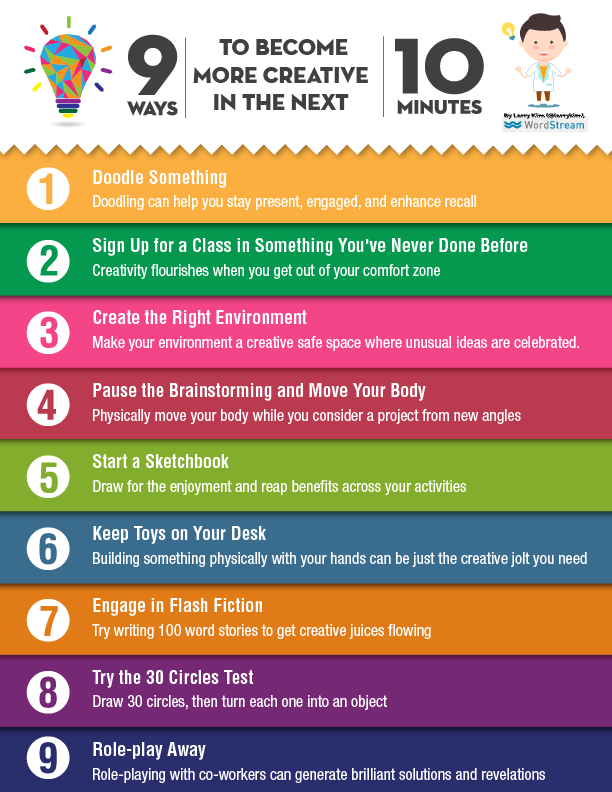 An infographic with simple 9 ideas for increasing creativity. An infographic with 31 prompts to increase creativity. An article with 25 ideas to be more creative. CCC provides advisory services and develops resources for organizations seeking evidence-based expertise in children’s creativity development. A collection of scholarly articles curated by the South Portland Library Information Integrators.